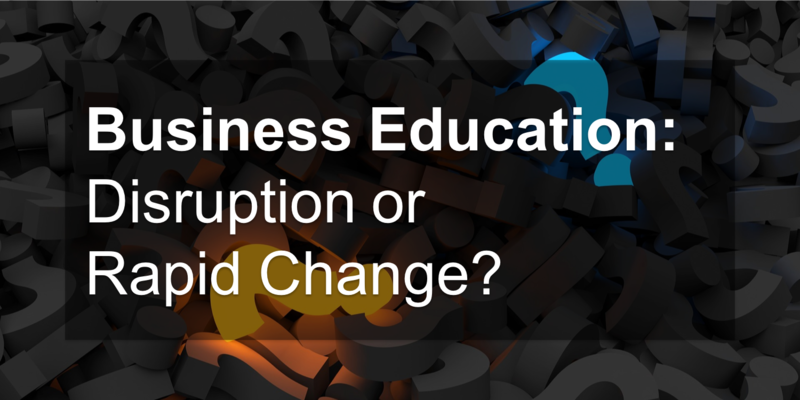 03 Apr Are Business Schools Disrupted or Just Not Adapting to Rapid Change? Most of the many business schools we have worked with are convinced they are in a pitched battle against “disruption,” that famous and frightening state (for most organizations) coined by Clayton Christensen in his 1997 book, The Innovator’s Dilemma. There has been confusion around aspects of this topic since. In fact, Professor Christensen himself published an update to his original work in 2015, due to his concern that the definitions he had presented of what disruption actually involved were being misunderstood and misapplied. We share the same basic concern he had about the concept, but in our industry: business education. Not everything threatening the status quo in an industry—even if only rapid change rather than the emergence of fundamentally new business models changing all the rules—somehow fits the definition of disruption, requiring, therefore, massive innovation and change in order to compete with the “disruptors,” versus, well, just responding to rapid change. This distinction between “disruption” and “rapid change” ultimately matters because, when business schools operate from an “anti-disruption” mindset, we have found that anxiety and a loss of a sense of control—even decision-making paralysis and the emergence of severe risk avoidance—frequently emerge, which only make matters worse. Hoping to fight back against disruption, many business schools also find themselves over-reliant on what we observe is the popular but rather ill-defined notion of “innovation” as their remedy. Ultimately, disruption anxiety and the “innovation obsession” can distract business schools from focusing on what we believe is often the more dangerous condition: failure to adapt sufficiently to what are simply rapid market changes. These rapid changes include but are not limited to new kinds of students, changing demands of employers and consumers, price pressures, desire for new levels of technology-based program delivery, better customer experiences from the top to the bottom of the funnel, and more. At Eduvantis, we believe that, if schools don’t respond to changes in their particular markets—adapting strategically and aggressively today—and effectively measure and manage performance, they will continue to lose market share, perhaps irretrievably. 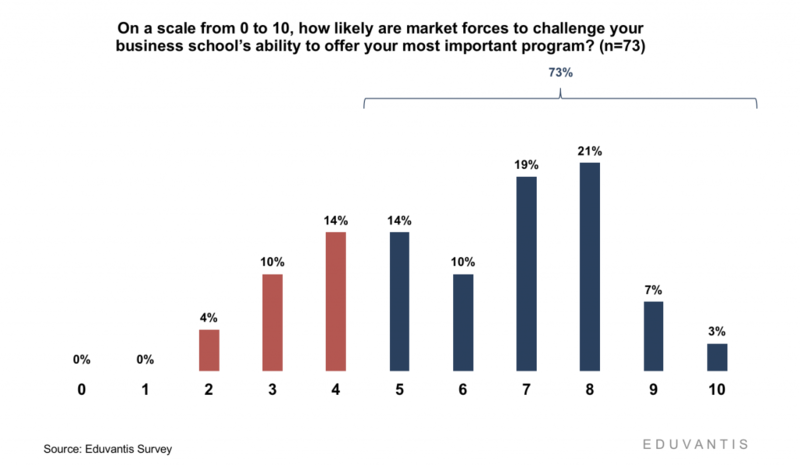 Business school deans we’ve surveyed within the past year confirm market forces are challenging their ability to offer programs successfully. They also recognize, however, that the most pressing market changes preventing their schools from competing effectively are related to how their products are ultimately positioned and marketed within rapidly changing target markets with increasingly unforgiving expectations. 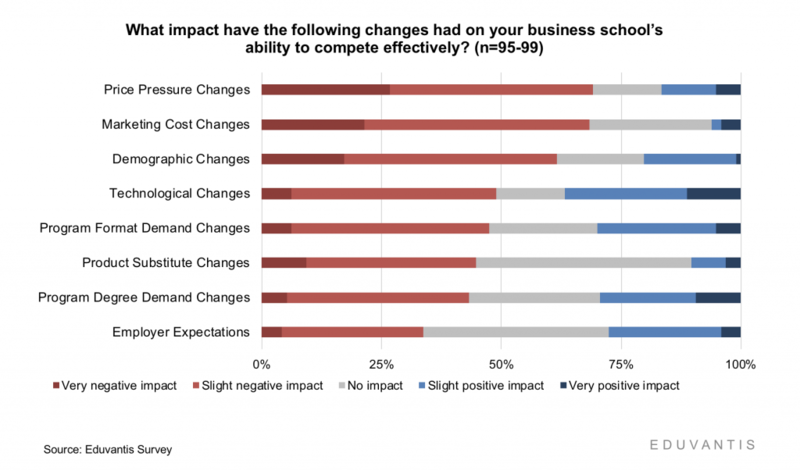 Has business education really been disrupted? We do not believe the conditions for true disruption (as defined by Christensen) have been met. Instead, our observation is that many business schools are simply not adapting to and managing constant market-driven change across the entire value chain. The Market. The first is using data to know and understand their real target markets. Most of the business school deans we surveyed last year felt uncertain when it came to even determining the size of their target markets or the basis on which their institution was gaining or losing market share against competitors (including online competitors. )In this environment, it is very difficult to keep up with market changes and competitive threats or to know what to expect from the investments you might make in new program offerings. We call this flying blind. The Product. Schools must know, with definitive data, what aspects of their program model (price, curriculum, delivery model, format, location, degree of online delivery, etc.) are producing an advantage or disadvantage against the expectations of their target audience and the models of their competitors. Marketing and Selling. More than 90% of prospective graduate business program prospects begin their search online and many of them complete the process online. Further, they are increasingly comparing their experience with your school to the best online selling environments they experience. Nearly every school is behind on meeting this expectation, even though they are “selling” a very expensive luxury good. The moral of the story is: Worry less about disruption and reinventing yourself and more about upping your game in response to what is no doubt rapid and challenging change. Everything doesn’t need to be “new, different, and innovative,” just delivered in a way that is more sophisticated and responsive to the rapidly changing needs of your complex group of stakeholders. If you have any questions about this topic, we would welcome talking with you.